We spend a lot of time showering, getting ready, and taking care of ~business~ — so your bathroom should be a place you actually want to be! 1. A waterfall sink faucet to make even washing your hands seem like a sophisticated experience. Get it from Amazon for $57.99. 2. A quality bath mat that can be easily washed and dried so you can step onto a *clean* cloud immediately after your shower. 3. A cute set of signs for those bare bathroom walls to remind you to relax. Get it from Homegrown Chic Designs on Etsy for $27+ (available in two sizes and colors). 4. A trendy, minimalist shower curtain because functionality and style can go together. Get it from Amazon for $15.99+ (available in five patterns). 5. And some fancy as heck shower curtain hooks that The Queen (probably) has in her own mansion castle bathroom*. *This is in no way a fact, I just like to imagine that she has hooks from Amazon in her bathroom. Get it from Amazon for $12.96+ (available in black and two-tier). 7. 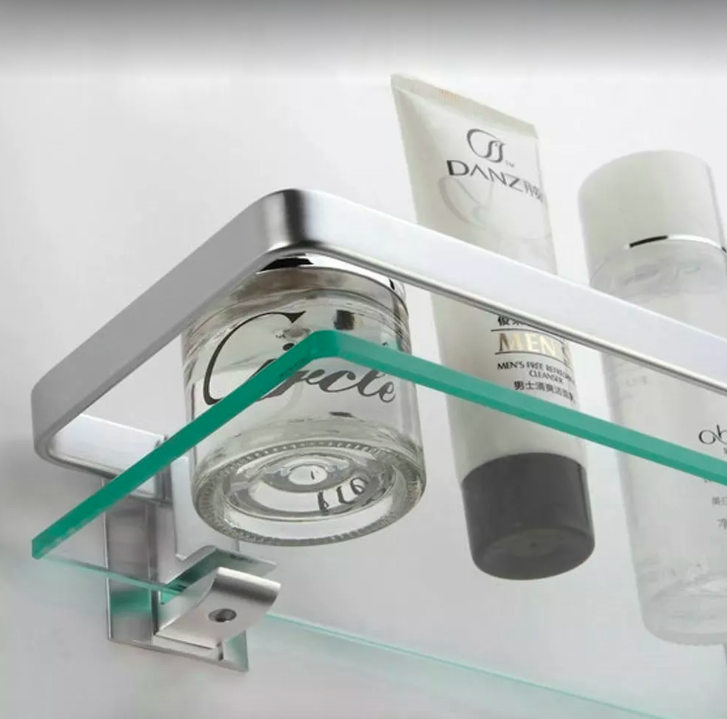 A matching bathroom accessory set that you'll actually want on your counters. Get it from Wayfair for $15.86. 8. 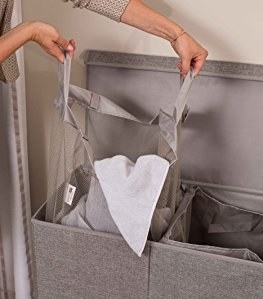 A linen-covered hamper with removable bags so you can keep your stinky clothes out of sight and make laundry a tad bit more bearable. Get it from Amazon for $29.99+ (available in single or double, and four colors). 9. Or for a little more style, a whicker owl hamper because ~whoOOooOOOo~ am I to tell you where to put your clothes? 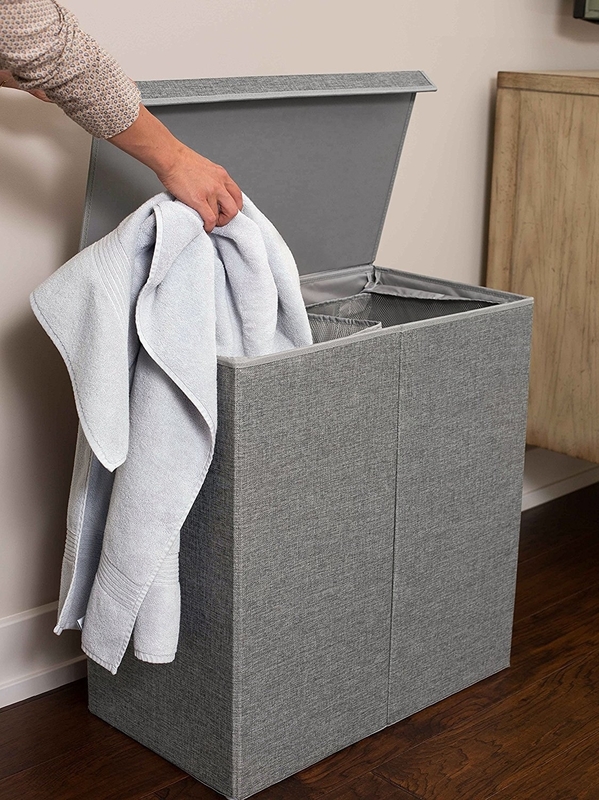 (You should put dirty garments in this hamper, though, 100 percent). Get it from PBTeen for $79. 10. A pack of soy candles in beautiful tins to make your bathroom smell like heaven and help you relax at the end of stressful work days. Promising review: "Absolutely lovely! These candles are super cute. Although they are small, their gentle scent is noticeable. I burned my first candle for about three hours and it was awesome. I also like the way they are packaged. Each candle is cradled and has its own lid. Instructions are also included. These are wonderful. I'm going back for more." —Tracy W.
Get a set of four from Amazon for $15.98. 11. 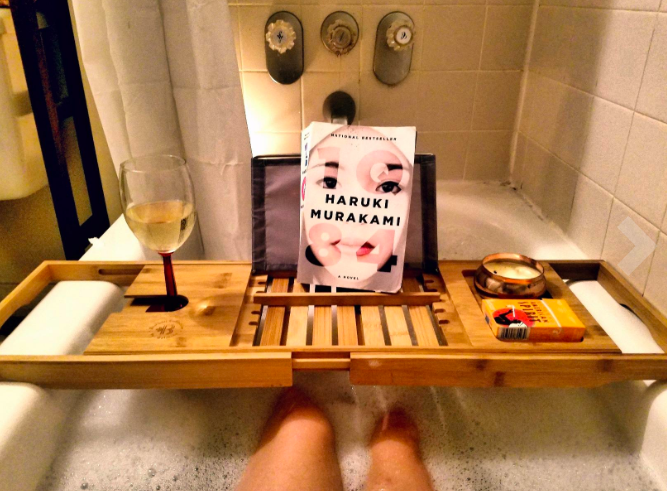 A bathtub caddy that'll let you take your best book, tablet, wine, and everything you need into the bath to ensure you never have to leave. Get it from Amazon for $38.99. 12. A set of luxurious, hotel-quality towels so you can feel like you're on vacation every time you step out of the shower. Get it from Amazon for $39.95+ (available in 11 colors). These are our top picks for the best luxury towels on BuzzFeed Reviews! 13. OR! These beautifully designed towels that'll bring a little color and fun into your bathroom. Get a six-piece set from Wayfair for $42.99. 14. A toilet pumice because nothing ruins the illusion that your bathroom belongs in a mansion more than a dirty bowl. Get it from Amazon for $9.29. 15. A glass soap dispenser that looks expensive AF but is actually quite reasonably priced. Get it from Amazon for $12.99 (available in four colors). 16. An over-the-toilet storage unit for keeping towels, extra TP, and other bath essentials in one nice, organized place. Get it from Wayfair for $114.99. 17. 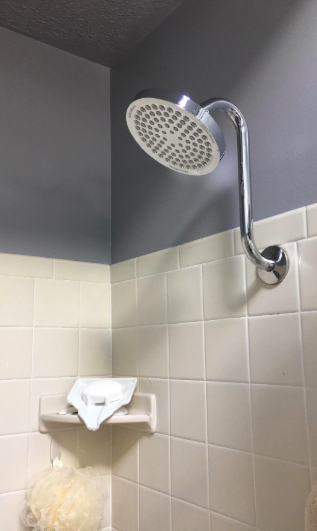 An extendable scrubber you can use to get deep down and up high, creating a bathroom people will think was cleaned professionally. 18. A super plush bathrobe you'll never want to get out of. You might as well inform your friends and family now of your new wardrobe. Promising review: "I was looking for a bathrobe to really *live* in. This is SO SOFT and plush! It's basically like if someone took my favorite blanket, and let me walk around the house with it draped over me (only without the dragging). I accidentally got the one with the hood, which I didn't even realize was an option, and I'm QUITE pleased. I was worried it wouldn't keep its softness after washing, so I put off throwing it in the washer for a while, but I needn't have worried. I've washed it three times now, and it feels just as wonderful as before. Get it from Amazon for $26.99+ (available in size S-XL, and 21 colors and style combinations). 19. An actually cute two-tiered shelf that'll free up a little more countertop space. Get it from Amazon for $15.99+ (available in three colors). 20. A toilet deodorizing spray for masking all those unwanted smells. Simply "spray before you go and no one else will ever know!" Promising review: "One bathroom in an apartment just isn't enough for two adults with a healthy colon. Enter Poo-Pourri. As this was the first time trying the product, I tried the original scent. It has an amazing lemon scent. It is very fresh and not overpowering. It is not synthetic smelling. With most room sprays, you end up just smelling flowery poo. This masks the smell completely. I can walk in the bathroom 30 seconds after my boyfriend and only smell lemon." —Allison H.
Get it from Amazon for $4.99+ (available in 10 sizes and 24 scents). 21. A miracle-working, multipurpose cleaner you can use to rid your tub, sink, tile — pretty much everything in your bathroom — from nasty stains and grime. I cannot fully express how absolutely obsessed I am with this product. It's the Windex to my My Big Fat Greek Wedding. Stains? Bar Keepers Friend. Grime? BAR KEEPERS FRIEND. I've used this to get rid of tough tub stains, clean grout, and transform my stovetop. I love this product so much I wrote an entire post raving about what a workhorse it is. Read my full Bar Keeper's Friend review. Get it from Amazon for $5.04. Need a sponge to go with this multipurpose cleaner? Check out our pick for the best sponges on BuzzFeed Reviews! 22. AND! A power scrubber to help you restore grout to its prime and get those crevices sparkling clean. Promising review: "I love it! Here's my list of why I love it. # 1. Much better quality than I expected. It's solid, and doesn't feel cheap. It's also bigger than I thought, so it feels comfortable in my hand. # 2. It's powerful. Uh ya, don't put this thing near your mouth. It hurts, cause it's way more powerful and abrasive than an electric toothbrush. # 3. It works very well. It's great for cleaning around faucets. That's why I bought it. My faucets are now gunk free. Get it from Amazon for $13.42. 23. A Turkish cotton towel that'll leave you feeling like you're wrapped in luxury. Get it on Amazon for $10.88+ (available in seven colors). 24. 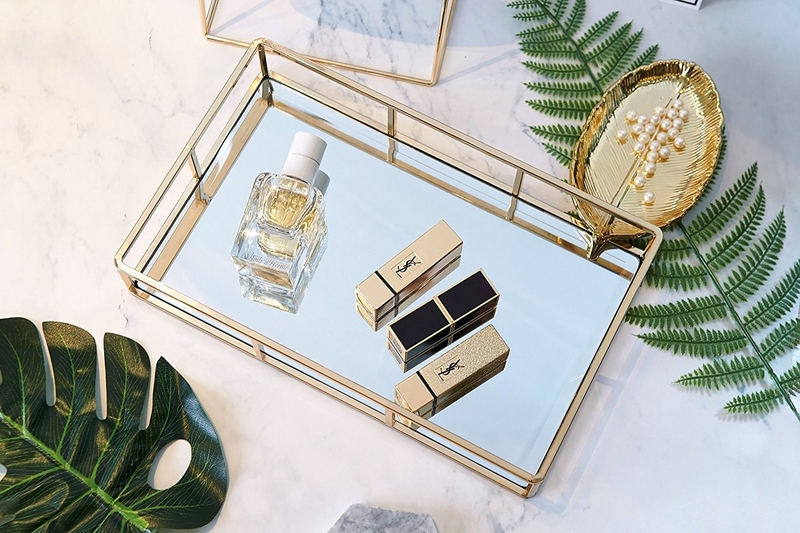 A timeless mirrored tray you'll need for all of your spa-day products. I'm talkin' scrubs, lotions, and essential oils. Get it from Amazon for $29.99 (other accessories available), or a similar all-gold one for $9.49. 25. A MARBLE toilet brush and holder because you're so sophisticated even your toilet brush has a lush place to rest. Get it from CB2 for $29.99. 26. A gorgeous waste basket for when you need to show the world how classy you are by having a ridiculously beautiful place to throw your trash. Get it from Wayfair for $30.99. 27. 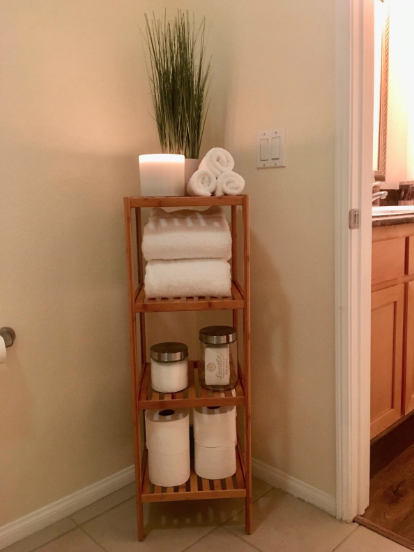 A bamboo storage rack to hold all your extra bath goodies so your guests don't have to rummage through your cabinets looking for toilet paper. Get it from Amazon for $39.99 (available in two colors). 28. A gorgeously designed set of cotton bath mats that'll cover heavy-traffic areas, and that are so soft your feet will never want to leave. Psst! These are machine-washable. Bath mats are popular homes for GERMS so you can easily toss these in the wash when they're ready for a good cleaning. 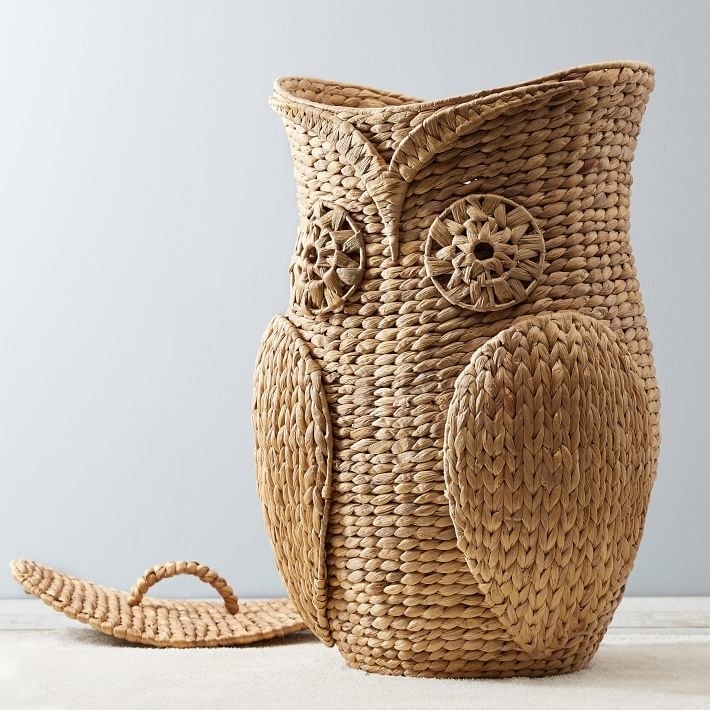 Get it from Pier 1 Imports for $37.95. 29. A pack of sea sponges that'll make you feel like you're actually at the spa. Plus, they're biodegradable and hypoallergenic! Get it from Pottery Barn for $19, or a similar one from Amazon for $9.99. 30. An over-the-door towel rack so your stylish hand towels have their own place in the bathroom. Get it from the Container Store for $19.99, or something similar from Amazon for $16.60. Need towels to fill this stylish rack? Check out our pick for the best cheap bathroom towels on BuzzFeed Reviews! 31. A wire basket with a convenient handle to beautifully store your new sponges and all of the the things you need but have no place to put. Get it from Amazon for $9.99+ (available in three sizes and colors). 32. A natural, plant-based multi-surface cleaner perfect for cleaning your bathroom without the harsh chemical scent. Get a two pack from Amazon for $14.24. Need some sponges to go with this cleaner? Here's our pick for the best sponges on BuzzFeed Reviews! 33. 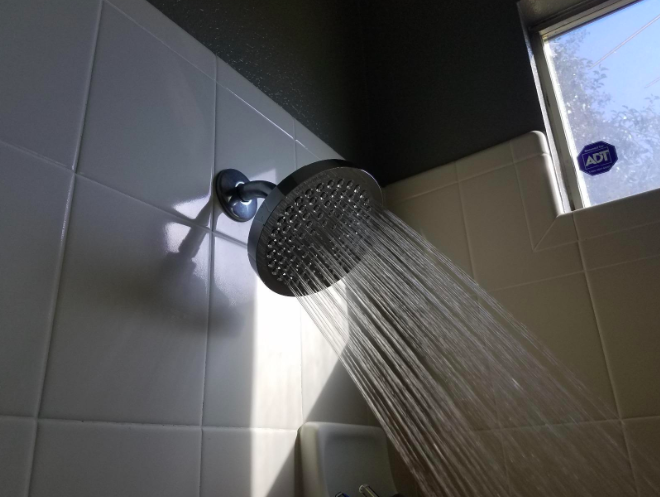 A rainfall shower head so you actually look forward to waking up in the morning...or getting ready for bed. I will not partake in the AM/PM shower debate!!! 34. A set of glass apothecary jars you can use to store your life-saving bath salts, cotton balls, and other bathroom necessities. Get a set of three from Modern Vase and Gift on Etsy for $39. And get some highly-rated and soothing bath salts from Amazon for $17.96+. This can also hold beer cans. Cheers. Promising review: "I bought this as a gift for my wife. 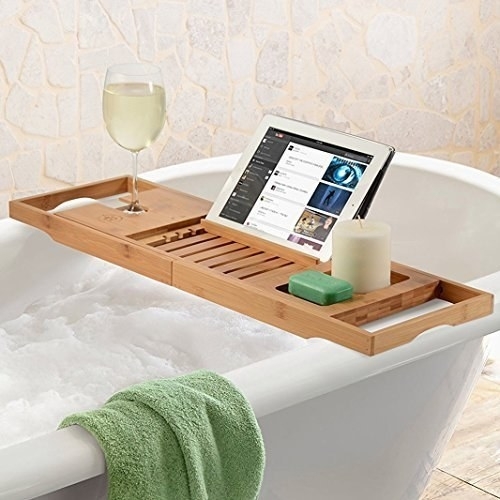 She loves to occasionally have a glass of wine when she soaks in the bathtub after a hard day. She loved it. It has plenty of suction to be very secure. Works great." —J. C. C.
Get it from Amazon for $13.99 (available in six colors). Now, turn on the hot water, pour in some soap, light the candles, and get to relaxin' in your peaceful spa bathroom.